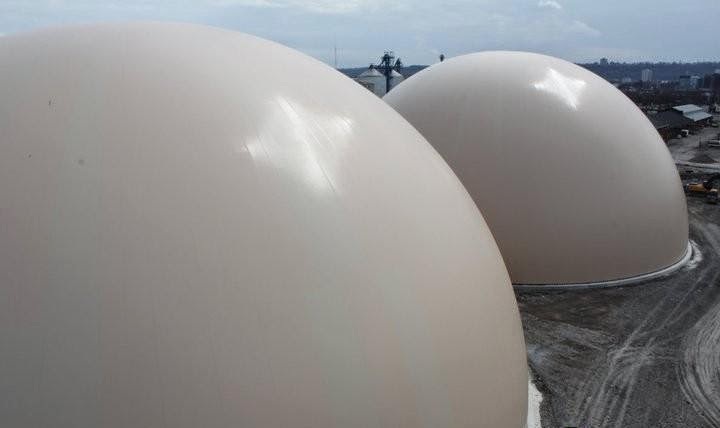 This project will place Dome Technology at the forefront for bulk storage in the growing Biomass industry. The facility will store 50,000 metric tons of wood pellets in two 190ft diameter domes at a height of 105 ft. 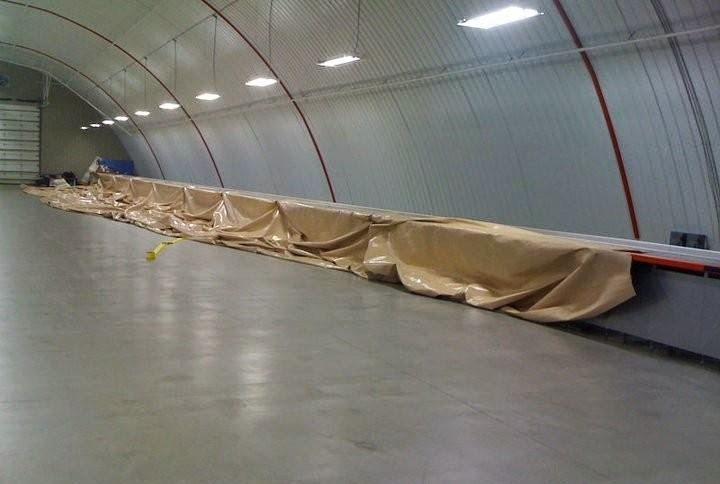 The state of the art mechanized handling system is designed to unload up to 60 rail cars per day. Under the domes lie nearly 500ft of reclaim tunnels to allow for reclaim and loading of 1000 metric tons per hour into waiting ships. 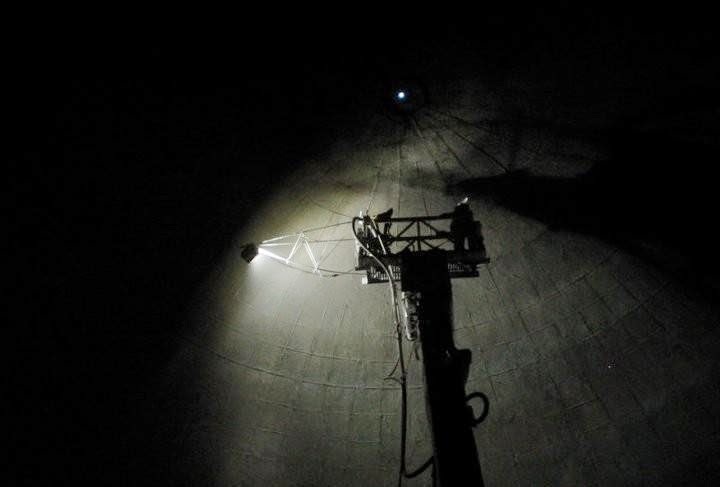 The construction of two 192ft diameter domes with a height of 90ft will be under way this month in Hamilton Bay, Ontario Canada. This facility is being constructed for Parrish and Heimbecker, a family owned company that has been in the agri-business for over 100 years. With a storage capacity of 40,000 metric tons, the project is scheduled to receive product in October 2011. Design engineering provided by ES2 of Idaho Falls. Formally classified as a thin-shell structure, the steel-reinforced concrete dome fascinates me. It epitomizes less-is-more thinking and presents an alternative to more conventional methods of construction today. Among its many qualities (beauty being one that I have chosen to discuss in another article) it is (1) strong, (2) energy efficient, and (3) easy to build. The steel-reinforced concrete dome bio-mimics nature’s ordinary egg. Chicken eggs are composed primarily (95-97%) of brittle calcium carbonate crystals. Thin-shell domes are composed primarily of concrete. Nature gives its egg some ductility by adding a light matrix of flexible protein reinforcement. The concrete in a dome is reinforced with tension-loving steel reinforcing bar (“rebar” for short). Both the egg and the dome have unique and inspired qualities of strength. Structural engineers analyze a building’s ability to withstand loads from above, the side, and below. Every force that acts on a building must be resisted by an equal and opposite force for it to stay still (or, remain “static”). While most buildings do this (hopefully the one you’re inside of right now! ), they do not do it equally well. Gravity is the most obvious force that a building must resist. The roof that protects us from the elements also resists its own self weight (called “dead load”) and the weight of people who might need to walk during or after construction (called “live load”). A typical building utilizes what is called a “post and lintel” method of resisting gravity where the load is carried from a horizontal member (the “lintel”) to a vertical member (the “post”). While the post is subjected to compression, the lintel is subjected to bending and, if undersized, tends to sag in its effort to transfer load over to the post. Domes resist the notion that more material must be used to span greater distances by simply exploiting geometry. In essence, a dome says, “I’ll span whatever you want me to span if you let me shape myself the way I want.” Gravity loads in domes are transferred directly to the foundation with little to no bending in the shell. Vertically, the shell’s concrete pushes against itself in close to pure compression, while a region of tensile hoop stress forms horizontally in the lower regions of the dome, which is resisted by the rebar. A steel-reinforced concrete dome presents a beautiful marriage of materials in that the concrete is ideally suited to compression while the steel is ideally suited to tension. The dome structure as a whole is loaded axially and saves in material by avoiding the inefficiencies of bending. In addition to gravity loads, buildings must resist laterally forces such as wind, earthquake, and sometimes active soil or other fluid loads. In rectangular structures, wind blows on large flat wall surfaces, thereby engaging vertical wall members by means of bending, which then transfer these loads to the horizontally placed sheathing of roofs and raised floors, called “diaphragms.” Acting like big deep beams, these diaphragms transfer the lateral load to “shear walls,” which are anchored by a foundation. The larger the surface on which the wind blows, much like a sail on a boat, the greater the force that acts on the building. Wind loading on a dome presents one of its more obvious advantages. There have been several case studies of domed structures outperforming more traditional buildings in hurricanes and tornadoes. It is also worth pointing out here that, much like the two-level, lintel-to-post gravity load path, which is simplified by a dome, lateral loads in more traditional buildings consists of a two-level, diaphragm-to-shear-wall load path, which, once again, is simplified by a dome. Another type of lateral load that a building must resist comes from earthquake-induced ground motion, which causes a certain percentage of a building’s mass to load its diaphragms and shear walls. Once again, the simplified nature of a shell reduces complicated diaphragm to shear wall connection details and the entire surface of the dome acts democratically in sharing the load. Finally, a building resists loads from soil below, sometimes expansive in nature. Much has been said in other articles about these soils and foundation technologies that can be used to resist them. From the standpoint of domes, which have circular footprints, verses rectangular buildings, which have rectangular footprints, the perimeter of the dome foundation will be shorter, yielding material savings due to the fact that a slab’s perimeter is often thickened to resist bearing from the walls above. While material savings of domes were touched on in the previous section, these were material savings due mostly to structural efficiencies. Even in an environment free of gravity, wind or earthquake forces, a dome presents material savings due to their geometry alone. Simply put, a sphere, of which a dome is part, yields more volume per surface area than any other shape. When speaking of heat loss, the primary considerations are how readily heat can be transferred through a wall, and the surface area of that wall exposed to the outside. We already identified the dome’s relatively small surface area, which, as it turns out, not only yields savings in material, but in energy as well. 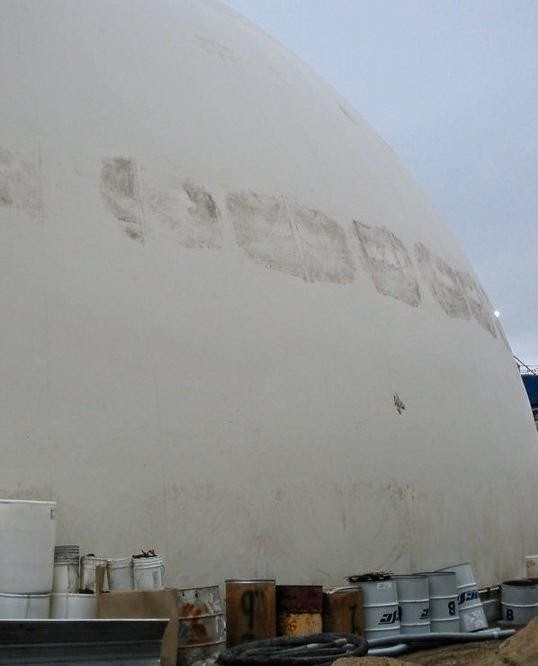 The composition of a concrete dome’s wall is the other consideration, which, when insulated on the cold face of the shell wall, yields one of the most remarkable benefits of a concrete dome over a conventional building. For years concrete thin shell structures were poured over a mounded earth form, a very time consuming and expensive process. 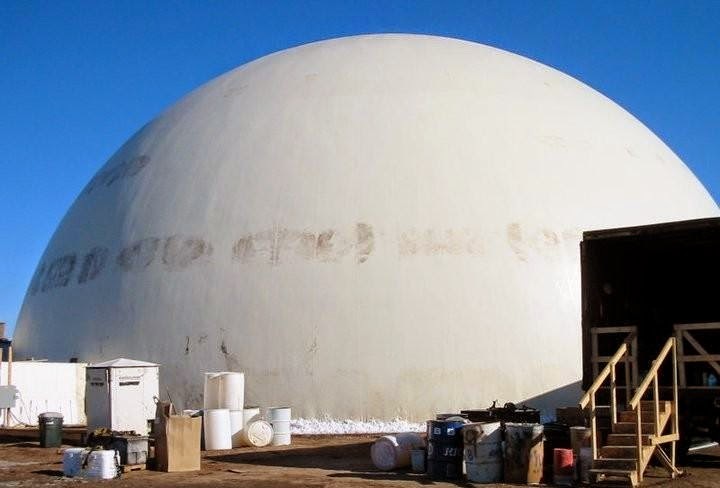 Pioneered in the 1970s by three brothers from Idaho who were spraying foam insulation for potato storage buildings and Dr. Arnold Wilson of Brigham Young University in the 1970s, the state-of-the-art concrete dome building technology is called the Monolithic Dome. Their fascinating construction method consists of a PVC-coated polyester airform that gets blown up like a balloon, then sprayed from the inside with foam and concrete. Having framed a few light wood frame houses and also built a handful of these domes while in college, I learned first hand how quickly and efficiently domed structures can be erected in relation to the competition. Even without the structural and energy-related benefits of the Monolithic Dome, the construction method alone presents a strong case as one of the most ingenious building systems in the world. While many factors go into selecting an appropriate building type for your needs, three that deserve special attention are strength, energy efficiency, and ease of construction. The steel-reinforced concrete dome stacks up very well against its competition when considering these qualities. Others, of course, include visual appeal, resale value, and ability to procure a loan.